“If the epidemic in Liberia were to continue in this way until the 1st of December, the cumulative number of cases would exceed 100,000,” says ISPM’s Christian Althaus. Christian Althaus posted the first estimates of the reproduction number for Ebola virus in the Guinea, Sierra Leone and Liberia outbreaks. The effective reproduction number (Re) shows the potential for further spread after initial control efforts have started. In the Science article, Christian explained that, “’In Guinea and Sierra Leone, Re is close to 1 and the outbreak could be stopped if interventions improve a bit.’ In Liberia, Re has been near 1.5 the whole time. 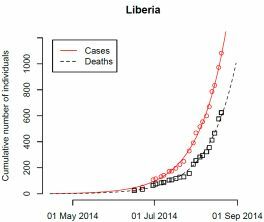 ‘That means work is only just beginning there.’” (see photo of model output, which suggests that Ebola virus is still spreading exponentially in Liberia). Christian Althaus is leading ISPM’s modelling efforts to predict the spread of Ebola virus and the potential impact of control interventions with statistician Sandro Gsteiger and epidemiologists Nicola Low and Fabienne Krauer. Matthias Egger is a member of the WHO Ebola Deployment and Data Collection working group, which will meet in Geneva on 4-5th September. World Health Organization: WHO provides regular updates and advice on its Global Alert and Response page. Twitter: Yes, sign up and follow the latest Ebola virus news from news services and journals such as @nytimescience, @Promed-mail, @NatureNews, @ScienceMagazine, @bbcworldservice, @MicrobesInfect, and people like @davidfisman, @cmyeaton (Caitlin Rivers), @c_althaus, @nicolamlow. Several major journals are allowing free access to all their published articles about Ebola virus, even the ones that usually charge for access: The Lancet, Science.